Residential cleaning is not for everyone and there’s a reason for that. Then again, it’s the perfect business for those who like to clean and make people happy. If that’s not you, then you might be better suited to office or janitorial cleaning. House cleaning services are the most in-demand service with 66% of the market share. Although it has the highest market share in the cleaning industry, that doesn’t mean the business will be the right fit for you. Commercial cleaning services are always in-demand and don’t experience customer loss that comes with changes to the economy. Since most commercial buildings are cleaned in off-hours, that should be a consideration in your decision to start a cleaning business. There are many different ways to build a cleaning organization. To have a successful business, you must be able to meet your customer’s needs and manage a staff (if that’s your business model) who are willing to follow the policies you implement to create the reality of your vision. 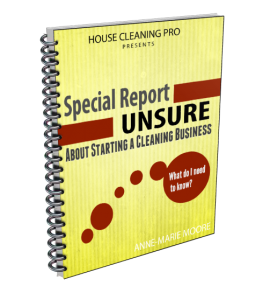 If you’re looking for an add-on business, you’ll discover what each type of cleaning service requires in this FREE report.